Leading up to the 2008 Mr. Olympia on September 26-27 at The Orleans Arena in Las Vegas, Nevada, we'll break down some of the most intriguing potential matchups and subplots to the contest. The second in our Olympia Dream Matchup Series: Melvin Anthony versus Silvio Samuel. WHY WE WANT TO SEE IT: The two were separated by a single place last year, and they went up against each other in the 2007 contest's second callout. Symmetry is the hallmark of both men, and both have similarly impressive shelves of muscle from delt to delt. Anthony has a slight height advantage, a noticeable weight difference and a lot more big-show experience. The matchup could be decided on conditioning, as Samuel is never far from his standard, while Anthony has a tendency to be hit and miss.
. 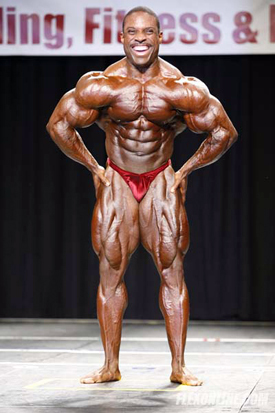 If either hears his name mentioned for a comparison with both Dexter Jackson and Jay Cutler, you might glimpse a brief smile before the posing exhalation. SEE FOR YOURSELF: Anthony's bulk and presentational prowess should shine brightly through a most-muscular assessment, particularly from the back. Samuel has appeared awkward on some of his compulsories, but he appears more comfortable show by show, and he does a lot of them. During a side-triceps shot, Samuel can draw attention to his crazy round muscle bellies and wicked triceps definition and a razor-sharp serratus. 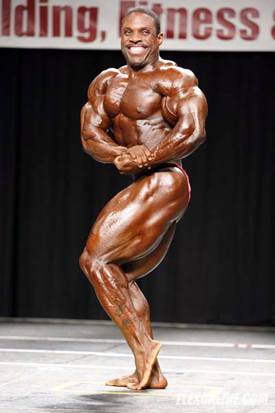 Turning around for a back double-biceps, Anthony's delts, upper-back size and lat fullness make it a prime pose for him. OUR TAKE: Slight advantage for Anthony, but only if he comes in at tiptop condition. Like last year, this decision could determine who is on stage for the posedown and who watches it from the wings.